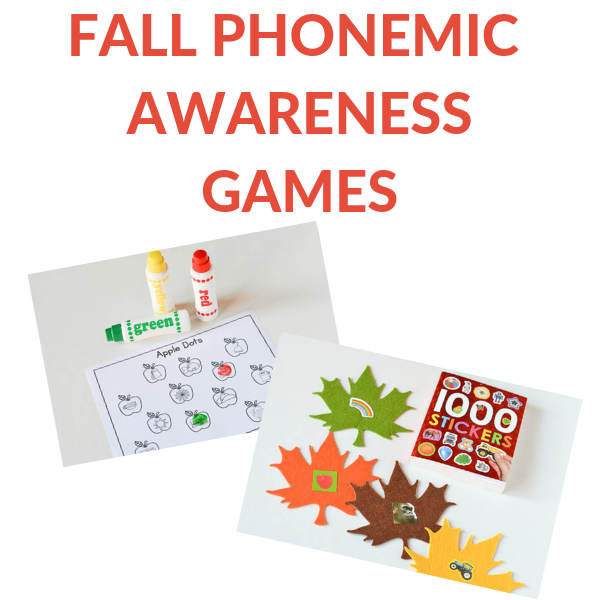 Usher in the fall season with this phonemic awareness games with the kids. They are a great way to build phonological awareness. Phonemic awareness at the preschool level usually involves identifying letter sounds and then identifying beginning sounds. Notice that the focus is on sounds and not the visual representation of the letters. You’ll notice that all of these activities can be differentiated to meet the needs of your kids. Preparing: Cut out the image cards. You may choose to laminate for durability. 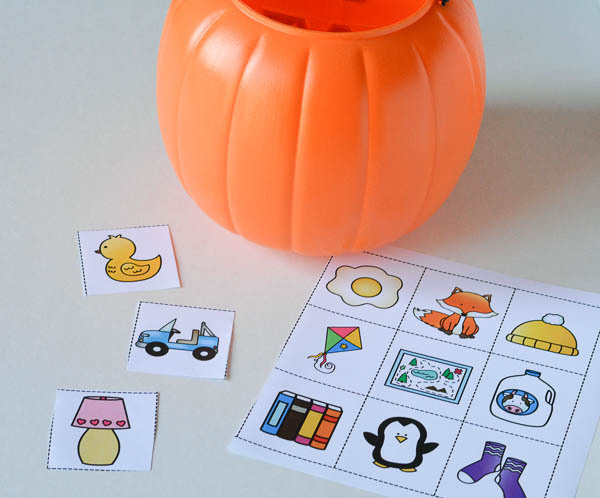 In this activity, kids will work on identifying ending sounds. The kids should take turns naming the picture on their card and then identifying the ending sound. For example, if the card bat is selected, the child would say /t/. If the child is correct, they place the card in the pumpkin. Continue until all cards are used. Some kids may only be able to identify the beginning sound. Others may be able to do the medial sound. Preparing: Pick 2 to 3 beginning sounds you want the kids to practice. 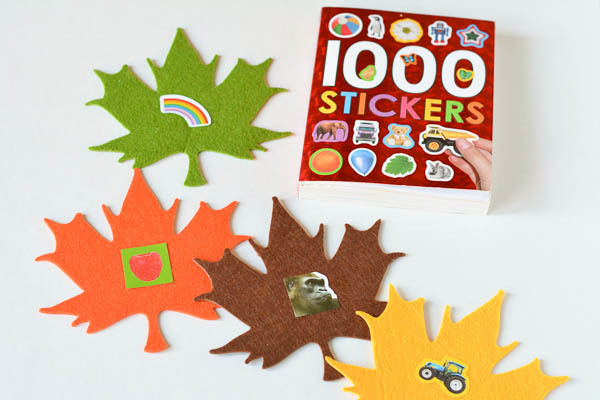 Place a sticker on each leaf. You may want to use a stronger glue such as tacky glue to help the stickers stick to the felt or foam. Scatter the leaves in a playing area with the images facing up. In this activity, kids will gather the leaves for a particular beginning sound and put them in the basket. Then, the kids will check to see if all the leaves in the basket are correct. Repeat for the second and third sounds. 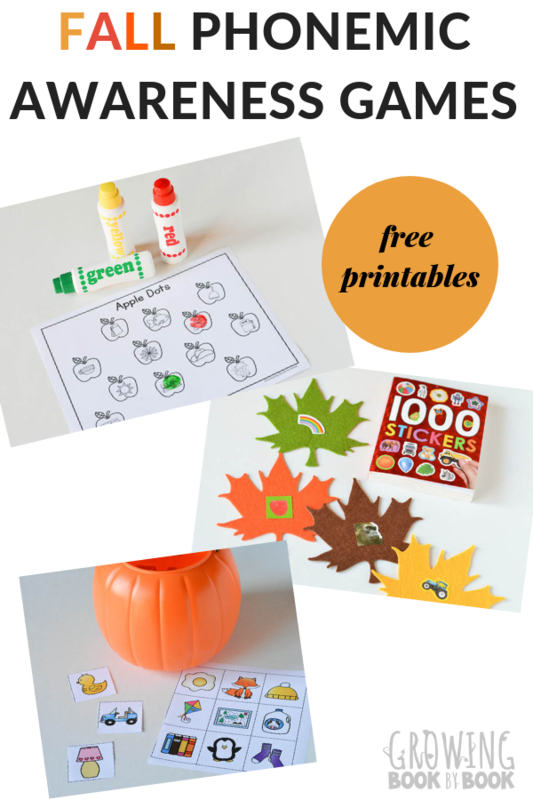 For another leaf beginning sounds activity, check out Beginning Sounds Leaf Sticker Tree Activity. Preparing: Print an apple sheet for each child. 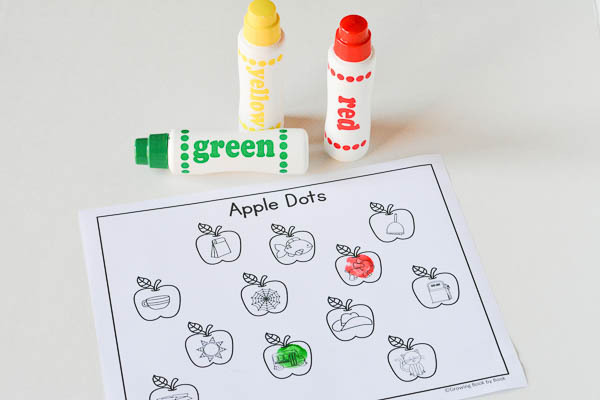 Each child will also need a red, yellow, or green Do a Dot marker. In this activity, the kids will listen for a medial sound and then stamp the apple that matches the sound. You could also modify this activity and call beginning sounds. If these activities sound helpful, you’ll want to join our free newsletter list. Each week we share timely literacy resources that will help you meet the needs of all your growing readers. As a thank you gift for joining, you’ll receive the printables for the activities above. For even more fall literacy fun, check out the activities and book lists below.